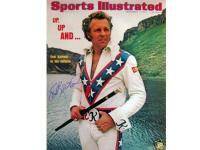 Amazingly, Evel Knievel and I share some common ground in our lives. When Evel was a young boy in Butte, Montana, his dad took him to see Joey Chitwood's Auto Daredevil Show. He credits that experience with sparking his lifelong passion for being a daredevil. Evel chose motorcycles instead of cars, but seeing that Joey Chitwood show was the genesis of his fascinating career. When I was a young boy in Augusta, Georgia, my dad took me and some friends to see Joey Chitwood's Auto Daredevil Show, and it sparked -- for a few days -- attempts by my pals and me to try some stupid, dangerous stunts on our bicycles. When our parents came to our "show" and saw us put lighter fluid on the ground and light it, they stopped the show.... and that was the end of that. My buddies and I all went on to other careers. In 1974, when Evel Knievel made his historic jump over Idaho's Snake River Canyon, it generated excitement the world over. His picture was on the cover of Sports Illustrated, and the TV replay of that jump is still listed as one of the highest rated Wide World of Sports ever on ABC. The buildup to that event would rival any Super Bowl. Evel promised he could, and would, attempt the half-mile jump. There were two failed practice attempts with unmanned "rocket cycles".... still, Evel said he would keep his promise and attempt the jump. On September 8th, 1974 I remember driving along Franklin Road, listening to live radio coverage of the Snake Canyon jump. As the moment drew near, and the "play-by-play guy" told how Evel was strapped into his Skycycle and the countdown was on, I actually pulled off the road into a church parking lot to listen. Evel managed to make it across, barely. 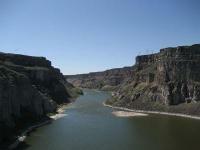 His parachute didn't quite work right, and he landed on the riverbank, just feet from the dangerous, swirling waters. For a few minutes nobody seemed to know if he was dead or alive. Such an heart-stopping event. Sometime around 1982, Evel Knievel was a guest on my local talk show Miller & Company. I found him to be an interesting man with a healthy ego. He had arrived at the television station in a huge bus, like the ones used by country singers. Behind the bus, he had a "u-haul-it style" trailer. I suppose that's where he kept his motorcycles. After the taping, we all walked out in the parking lot in front of Channel 4 where the bus was parked. I asked him who his driver was. "I drive myself" he said. After all the thanking and other niceties, Evel got into his bus and took off across the parking lot heading for the long, winding, steep driveway that connects WSMV to Knob Road below. By the time he started down the hill, he was probably already going 40 mph, and we all held our breath, hoping he could negotiate the turns without flipping the bus. To make matters more frightening, we could see the headlights of a car coming up the hill. Evel's bus and the car zoomed past each other. When the car pulled up next to us in the parking lot, it was Benny Kirby, one of our overnight engineers, just coming to work. He rolled down his window and said --and I'm not making this up -- "Geez, I don't know who that was in that bus, but he thinks he's Evel Knievel!" I said, "Benny, when you get inside, ask someone who was driving that bus." Anyhow, happy birthday Evel Knievel. He turns 69 this week.